Get ready to get healthy! 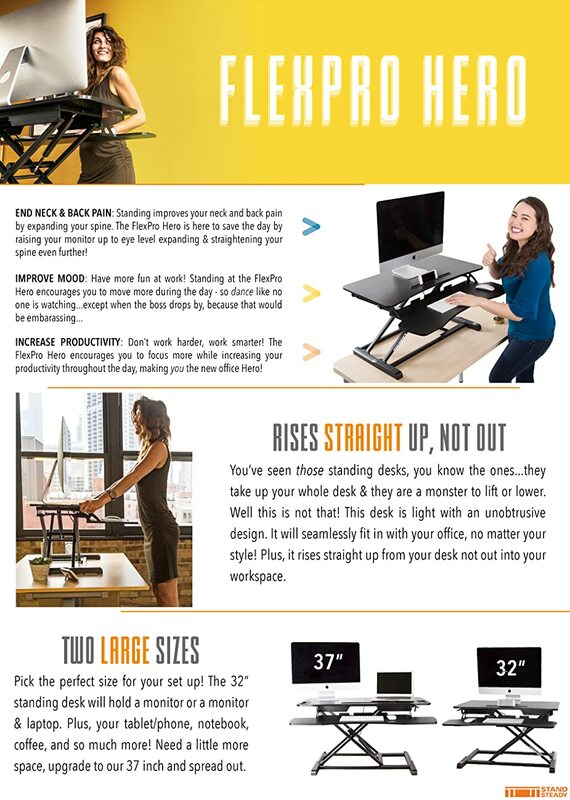 Introducing our newest and tallest standing desk converter – the FlexPro Hero 32" Sit Stand Desk Converter! Why is it the hero? Because it’s strong, super tall, and lifts with ease. Release the hero in you and start standing with the FlexPro Hero today! EASY LIFT: Effortlessly transition from sitting to standing in seconds! This adjustable desk riser includes a hydraulic pump lift that enables you to sit or stand with the pull of a lever. EXTRA TALL: Were you the center on your high school basketball team? No problem! Stand Steady’s FlexPro Hero is a slam dunk. The Top shelf will rise up to 20” above the desktop! When used with a typical office desk – this will accommodate practically anyone up to 6’3”! SPLIT LEVEL SURFACE: Places your keyboard and monitors at the right heights relative to each other. That way you enjoy strain free typing and viewing whether sitting or standing. Only need one level? Simply remove the keyboard tray and keep on working! STURDY & SLEEK: An adjustable height desk you can trust! Its strong base can hold up to 35 lbs.! Sturdy enough to hold your 2 monitors, or your beloved iMac, all of your favorite accessories, and anything your super powers require. It took 30 minutes to assemble the desk, assisted by the screwdriver included for the benefit of 4 assembly screws. The company made the order process enjoyable, the delivery was on-time, and the end user was delighted with the product. We just purchased the FlexPro Air Two Level Sit Stand Desk Converter. We have started with one, to see how our employees like the sit/stand concept in general and the Flex Pro Air Two specifically. They love it! It it easy to assemble, exceptionally sturdy and large enough to hold to monitors. We will definitely be ordering more! It came without the parts necessary to attach the lower shelf. They did send them about 2 -3 weeks later. The desk is nice. Received my product and the ad was a little misleading. The one I purchased or thought I was purchasing was supposed to be 31.50 inches for the top and 37 inches for the keyboard. I needed more keyboard space. I get the item and the keyboard was not what it advertised. Disappointed. The desk is very easy to put together and is very smooth to pull up and push down for sit or stand up position. It’s big enough for my laptop and monitor. I am glad I chose this product after a long research. Highly recommended for those who is looking for a stand up desk.